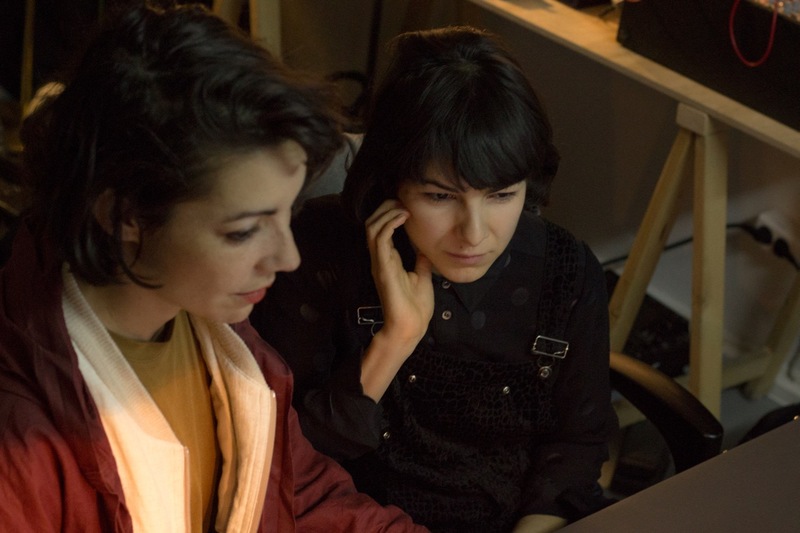 Meet the two November residents of Amplify Berlin: Albertine Sarges and Daniela Huerta aka Baby Vulture. And listen to the tracks they have been working on this month together with their mentor Lucrecia Dalt. The two will present their new live sets on Thursday at ACUD Club. Lucrecia Dalt will play a DJ-Set. Albertine Sarges is a songwriter and performer. In Berlin she is mostly known as Ossi Viola, the smiling Italian diva with shoulder pads in the synthpop group ITACA. She also plays keyboards for Kat Frankie. She recently gathered a campy girl band around her (called “the Sticky Fingers”), performing music and eating noodles in public. Daniela Huerta is a multimedia artist also performing under the moniker Baby Vulture. Her main interest concerns the human (female) voice and the body as a medium to create narratives which position one in an illusionary or defined time and space. She seeks to find variables and errors which allow her to explore distinct territories that she later breaks apart, combines and assembles together, creating her own fragmented language. What were your expectations when you applied for Amplify? Would you say these expectations were met? 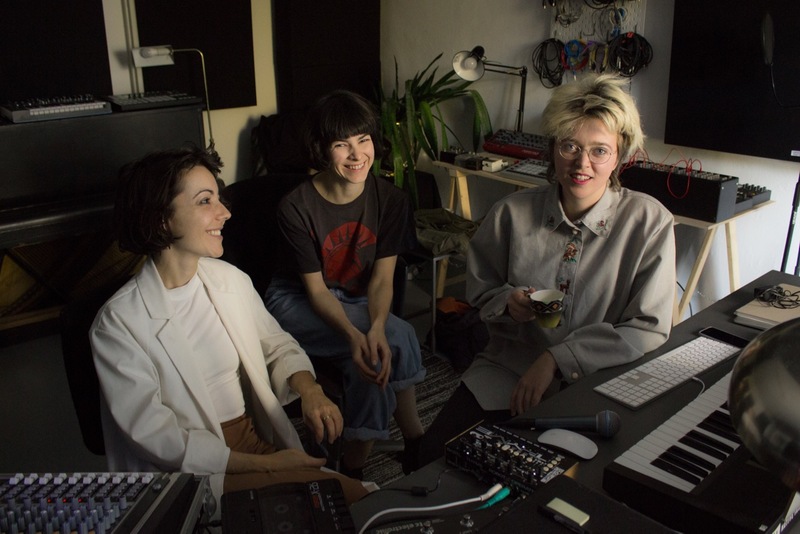 Albertine: My wish for Amplify was to block some time and space for my own musical development after a year of many session jobs at other people’s bands. I needed to figure out new sounds and learn more production skills to develop on an aesthetic level. My expectations and needs were absolutely met! Daniela: It’s generally difficult for me to organize my ideas and to give structure and body to my compositions, so I was mainly expecting to learning that. I’ve done a couple of collaborations doing live vocals as well as body performance and now I am focusing on developing my own material to play live. Throughout the past weeks, after a lot of experimentation and with Lucrecia’s guidance I’m happy with what I’ve accomplished. How has your residency gone so far? Any highlights? Albertine: The residency went through ups and downs, all in all a very memorable episode in my life. My highlight was engaging the first time with a drum machine (Elektron Analog MKII). Daniela: It’s been a very interesting process where I had moments of total confusion and many others of just allowing myself to dive in and to have fun. Whenever I thought too much about what I’m still learning or discovering, I limited myself creatively. So the fun and the spontaneous moments led me to doing sounds or vocals which I don’t usually do. And yes highlights … I fell in love with the HAKEN and with the piano which I never really had the chance to play before. I have felt very at home since I started the residency and I have truly felt Philip, Shub and Lucrecia’s support. How was working with a mentor? Is there something in particular that you have learned during the residency? Albertine: I was overjoyed to meet a team of dedicated helpers and our personal mentor Lucrecia Dalt, who has a very sensitive and open touch, which is incredibly helpful. I think this is the first time ever, that I produce music and make a mentor listen to it – I am still quiet confused and shy and thankful for it. From day one I realized, this was the first time I had an institution behind me that offers staff and ressources to back me up. This gave me a lot of motivation to work on my music. Daniela: It’s been great! To me Lucrecia pays great attention to detail, both sonically and conceptually talking. So I enjoyed this exchange very much. I had a few moments of stress or uncertainty and she made me feel calm and helped me understand I should enjoy the process instead of trying to present a finished piece. Technically I’ve learned many interesting methods and alternatives she finds to make sounds very rich and present. 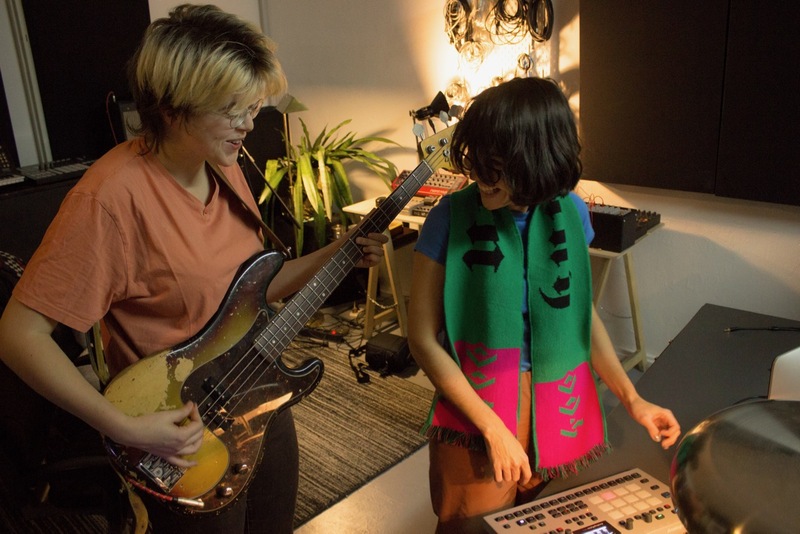 Albertine: I spent much more time producing tracks than working on my life set, as I am regularly on stages and I felt it was important to get more sophisticated on the producer’s side. The showcase will be a last minute production that tries to fuse both, my work in the studio and my band’s force. So the spoken word parts, the drum machine and layered vocal pads will be new elements, while groovy bass and guitar lines, a brushy flute with sound effects and harmonic call-and-response parts will stay as they have been developed over the last year. Daniela: I really don’t know!! I just want to present what I’ve learnt and explored the past weeks in the studio. Albertine: I would like to finish the production that I started at Amplify’s and publish it as an EP. I might safe money for a drum machine. And I want to record an LP as a producer, dwelling more on the Massive Attack/Nine Inch Nails-vibes that I discovered in me through the residency. Daniela: Doing this residency has given me gave me a lot of motivation the push I really needed. My plan is to keep developing my live set and productions without restricting myself to anything specific. Karma Ltd. Extended Radio Show #4: Brauchen Wir Einen Linken Populismus?